Seek professional opinion and treatment about your Achilles Tendinitis today. Experience Orthopaedic Surgeon with most advanced treatment. Call us +65 97731458 to schedule for an appointment. In noninsertional Achilles tendinitis, fibers in the middle portion of the tendon have begun to break down with tiny tears (degenerate), swell, and thicken.Tendinitis of the middle portion of the tendon more commonly affects younger, active people. Insertional Achilles tendinitis involves the lower portion of the heel, where the tendon attaches (inserts) to the heel bone.In both noninsertional and insertional Achilles tendinitis, damaged tendon fibers may also calcify (harden). Bone spurs (extra bone growth) often form with insertional Achilles tendinitis.Tendinitis that affects the insertion of the tendon can occur at any time, even in patients who are not active. Debridement and repair (tendon has less than 50% damage). The goal of this operation is to remove the damaged part of the Achilles tendon. Once the unhealthy portion of the tendon has been removed, the remaining tendon is repaired with sutures, or stitches to complete the repair. Debridement with tendon transfer (tendon has greater than 50% damage). In cases where more than 50% of the Achilles tendon is not healthy and requires removal, the remaining portion of the tendon is not strong enough to function alone. 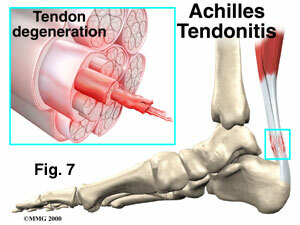 To prevent the remaining tendon from rupturing with activity, an Achilles tendon transfer is performed. The tendon that helps the big toe point down is moved to the heel bone to add strength to the damaged tendon. Although this sounds severe, the big toe will still be able to move, and most patients will not notice a change in the way they walk or run. Posted in Foot and Ankle Pain and tagged achilles tendinitis, achilles tendon, achilles tendon doctor, achilles tendon inflammation, achilles tendon pain, achilles tendon repair, achilles tendon specialist, achilles tendonitis, clinic for achilles pain, tendon achilles.